As you’re probably aware, the 2018 and 2022 World Cup host countries were announced on Thursday. Russia won 2018 and Qatar was awarded 2022. There are many fascinating issues to discuss, but given the focus of this blog, I wanted to zero in on one interesting element: the Thailand connection. Some background: Prior to the vote, much of the Western European media echoed the notion that the front runners for 2018 were Spain/Portugal (home of the scintillating world champions, Spain) and England (home of robust infrastructure and the world’s most popular domestic league). But Russia — considered by some to be an outsider — won, of course. This may not have been as big an upset as it seems, but it was still surprising to many observers. It’s worth noting that, as I understand it, many within Russia considered their bid to be the strongest all along, chiefly because the World Cup has never been held in Eastern Europe. The process by which World Cup bids are awarded has been the subject of increasing scrutiny in recent years. Here’s how it works: A 24-man panel — the FIFA executive committee — decides, behind closed doors, which countries will be allowed to host the world’s most-watched sporting event. Votes are secret, and are cast in an exhaustive ballot system, with several rounds of voting until a winner receives a majority. There is no official transparency, though reports usually emerge, afterward, regarding who voted for which countries. Allegations of corruption — the idea that votes are bought — have been raised in the past. And significantly, just before this year’s winners were announced, the BBC program Panorama ran a show called “Fifa’s dirty secrets.” So the selection process is murky, confusing, and said to be tainted by back room deals. On to the Siam connection: Thailand’s Worawi Makudi sits on the FIFA Executive Committee. Competing countries are often thought to secure votes by courting — legally — the loyalty of individual committee members. 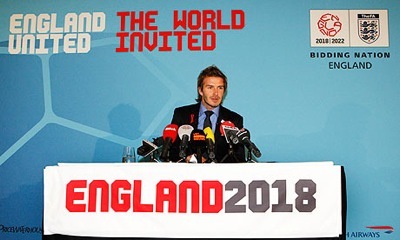 In May, England’s Football Association (the FA) announced that the national side would be playing a friendly here in Bangkok in June 2011 — a first-ever meeting between England and Thailand. This remarkable match, combined with the fact that British coaches Peter Reid and now Bryan Robson have coached the Thai national team, have been seen as efforts to curry favor with Thailand in order to secure the vote for England’s 2018 bid. The England-Thailand game would have drawn a large crowd given the great popularity of the English Premier League among Thai fans and would have presumably been commercially lucrative. But it would have exacted a physical toll on the Three Lions’ players given the long flights in each direction. England finished dead last, receiving just two votes, one of which came from their own representative. The other vote? It didn’t come from Thailand’s Worawi. It’s unclear who he voted for, but it apparently wasn’t England. The fallout: The Telegraph reported yesterday that England has cancelled the Thailand friendly. Mind you, the story says the FA had received indications some time ago that Worawi wouldn’t be voting for England, so one wonders how much of a shock this really was. In addition, a word of warning regarding sources: The Telegraph story says that “the FA intends to cancel the fixture,” but there is so far no news of this on the the FA Web site. However, the match is not listed on the fixtures page, though this may be due to the fact that it is — was? — a friendly, not a competitive game. The Bangkok Post also ran a short piece about the possibly cancelled fixture, but it appears to be merely a summary of the Telegraph story. For the record, I am not suggesting that anything inappropriate occurred between England’s FA and Thailand or Worawi. But I think the episode illustrates the kind of efforts that FAs undertake to try to secure the backing of executive committee members — and just how tricky and unpredictable the voting process can be. Issues for another post: Qatar‘s winning 2022 bid (the country’s population is estimated at 840,000, and it covers an area about the size of Connecticut); the prospect of a winter World Cup and/or cooled, open-aired, “carbon neutral” stadiums (don’t miss the artist renderings) to beat the heat; and the U.S.’s failed 2022 bid. Are the best new Thai chefs farang?